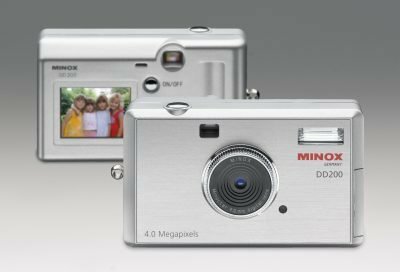 Minox DD200 - Stainless Steel Style Digital Compact Camera: with 4.0 million pixels! With the MINOX DD200 the optical specialist from Wetzlar, Germany present a new look digital camera. The ultra-slim DD200 with its modern stainless steel look is a perfect addition to the existing range of modern MINOX products: 4 million pixels and a 4x digital zoom are just two key features of this particular camera. In spite of its extremely compact size of just 94 mm x 56 mm x 26 mm, the new MINOX DD200 sports a 1.5“ TFT colour monitor which enables immediate image assessment both during and after the shot. The fast picture sequence permits spontaneous candid photography whenever you want it. The built-in flash switches on automatically when needed and ensures extra illumination even under critical light conditions. The optional video recording feature of the new DD200 opens up a completely new area of photography for the user, making it possible to capture those fleeting moments on video as well. In addition to the internal memory (16 MB), SD cards with a storage of up to 128 MB can be used as well. This offers photographers a greater amount of flexibility with the possibility to record a large number of images. The camera comes with a USB cable which is used to transfer images quickly and conveniently to a computer. Images can then be touched up on the PC using any commercially available image software and then sent directly to friends and family. The elegant and slim DD200 is a great companion for many occasions, always ready and waiting to capture those unforgettable moments.